The Baker Band Slab Edger is perfect for edging wide material and will accept slabs as large as 24” across. It uses thin-kerf band blades instead of circular blades. Therefore, it doesn’t have kickback and throw wood like circular edgers. This can also be a very versatile edger to edge slabs, boards, two-sided cants and even round logs up to 8” in diameter. It’s productive enough to keep up with scragg mills producing 25,000 board feet per day. Your material can be as tall as 10” and still pass through the Baker Band Slab Edger. That’s more than twice the capacity of most edgers. The Baker Mini-Scragg Mill accepts logs up to 12” or 16” in diameter. It’s perfect for running debarked scragg blocks, peeler cores, or lodge pole pine. The Baker Mini-Scragg Mill is very versatile. You adjust the cutting size simply by pushing a button. The blades adjust to any preset width from 3 1/2” to 12”. You can run your slabs through “bark-side-down” for improved blade life in nondebarked slabs. With the lumber inverted this way, centering the piece is almost automatic. Blade damage is reduced because the blades enter down through clean wood and exit through the bottom bark side where grit and gravel can lodge. 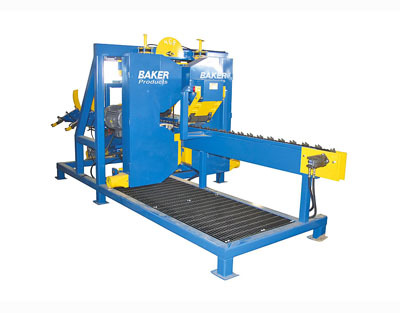 Production rates of 15,000 - 20,000 board feet per day can be reached with its thin-kerf band blades.Both machines come complete and ready to run with all electrical components. A pedestal-mounted remote control station is also included.